We are an English Longsword team. You can occasionally see us dancing in Downtown Santa Barbara. We have performed as part of “First Thursday” Arts festivities on State Street and at the Granada Theater. Each December we dance as part of the Mummers Play in the Santa Barbara Revels. The Pacific Sword Company is also a part of the Santa Barbara Country Dance Society. About Longsword: The Longsword Dance is a “hilt and point” sword dance found mainly in Yorkshire, England. It uses rigid metal or wooden swords. Although longsword dances are found scattered all over Yorkshire, there are particular concentrations of dances in the northern part of the North Yorkshire Moors and around Sheffield. Longsword dances vary in the way they are performed, with some being slow and militaristic such as at Grenoside, or performed with pace and speed like the Handsworth dances near Sheffield, others have different features including variations of numbers of dancers and distinctive movements. The Pacific Sword Co. features a dance from Kirkby Malzeard – a small village on the edge of the Yorkshire Dales – but we add a few flourishes of our own to the dance. 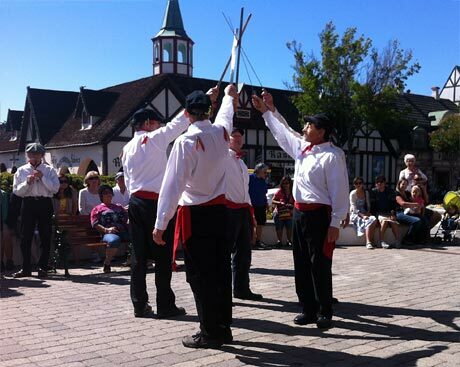 We also perform a dance inspired by Scottish sword dancers of the 17th Century from the town of Elgin. The earliest records of sword dancing from continental Europe indicate that the performers were often members of trade guilds or other such groups, and the dancing itself frequently occurred as part of a grander pageant. Sword dancing was a common activity in the villages of Northern England until the early part of the 20th century – and it is still kept up by a few village teams even today. You may also see us dance as “The Bowler Boys” when we don rag coats and bells to perform Morris dances from the Forest of Dean area near the Welsh border. We hope you enjoy these simple entertainments from an earlier, less complicated and slower paced era!